I’ve been reading Mercedes Lackey’s Valdemar series for years, but some things about the series rub me the wrong way. Valdemar is a fantasy series set in a medievalish kingdom with magic horses called Companions. As a medievalish society it should be…. not progressive, socialist, or other modern things. And yet, it is. In the novel Take A Thief, which tells the early history of the character Skif, it is told that the Crown has decreed that the school kids in the capital Haven get a free meal at government expense. It isn’t mentioned that the free meal is limited to the poor by any test of means. But it is mentioned that children who get through the mandated elementary education have to leave school and thus miss the free meal. Another question is the education itself. In various Valdemar books it claims that Valdemar mandates elementary education for children though it seems that since the education is carried out by the various religions that perhaps Valdemar is requiring the religions to fund the schools rather than spending its own taxpayer funds on it. The question arises: how does a medievalish fantasy world even come up with the idea of such big government programs? In the real world they didn’t come along until later. In part because medieval central governments were weak and the local lords had more power over the everyday life of their people. The free meal program might have been a part of the normal charity programs of a medieval society, but only if it was confined to the poor. They hadn’t invented the concept of handouts for all classes of people yet. Even in our country the idea of a free summertime school lunch for all income levels (yes, that is a government program) is controversial. And then there is the idea of education for all. In the medieval societies, most occupations didn’t require education or literacy. It seems a silly burden to impose on children who will grow up to be farmhands or carpenter’s assistants or street sweepers. Now, if Valdemar had a state religion, there might be a call for universal religious training, which might, like the first Sunday Schools, include reading and arithmetic training. But Valdemar decrees ‘No One True Way’ and that seems to mean that its religious picture is one of dozens of varieties of polytheistic paganism. Now, the reason medieval societies didn’t have the full list of big government programs is that they cost the central government more money than it could raise by taxation. Medieval people, like people today, didn’t like high taxes. Why risk a tax revolt to fund social programs when the Crown had more immediate needs like funding an army for when wars happened? Or for when subordinate provinces rebelled and needed to be reconquered— perhaps because of a revolt against high taxes? Of course the real reason fantasy worlds like Valdemar have anacronistic Big Government programs is that there are fantasy readers and writers who are Progressives/Socialists/Leftists who love these programs so much (because they never had to live on them) that they put them in to their fantasies whether they make sense or not. And that’s OK. But I’d like a fantasy world with less government and more freedom, personally. Today I am celebrating two new books I read recently. The first is one in the Elemental Masters series by Mercedes Lackey, Unnatural Issue. These books are a series of fantasy-romance novels set in Edwardian England. The first in the series was rather ruined for me because the heroine, a female doctor, had a clinic to hand out quack birth control to prostitutes and other loose women, and there was a certain hint that the doc may have done illegal abortions as well. The current book in the series doesn’t feature hints at prenatal child killing, but there are the usual Neopagan/Wiccan elements, so I wouldn’t recommend it to readers under 21. The heroine of the story is a girl, daughter of a Earth-element mage, whose mother died at her birth and whose dad handed the child over to the servants with orders that he never see the child again. The girl, Susanne, was raised by the servants and worked as one. Until she grew up and Dad, who had turned to the forbidden art of necromancy, saw she was the very image of her dead mother— and just what he needed for his planned spell to bring his dead wife back to life. Susanne has to flee and runs in to the elemental mages who are tracking down her dad because he’s working forbidden necromancy. The story ends, after much thrilling struggle, with the defeat of the evil mage and a romantic attachment for Susanne. The other book is one I ordered as part of my current studies on the subject of Islam. ‘The Complete Infidel’s Guide to the Koran’ by Robert Spencer. It’s not so much a religious studies book as a current affairs one, showing why, in the author’s opinion, the Koran and its contents are quite relevant to much that is going on in our world today. I would recommend reading it as part of a reading program that includes other books on Islam by other authors and from other points of view. My young tomcat Simon is resting in the house today. He’s got an infected sore, probably from being the victim of tomcat-on-tomcat violence. He really likes the attention he gets being in the house by himself instead of being on the porch with the other cats— most of whom stay on the porch all winter rather than in the barn like good barncats. Because the porch leads to the basement, which has a furnace. And today I’m finally making the lentil-sprout soup I’d planned for some days now. I had to put the finished sprouts in the refrigerator for a few days, taking it out some days to rinse the sprouts and keep them alive. Today I finally decided to get the soup started. 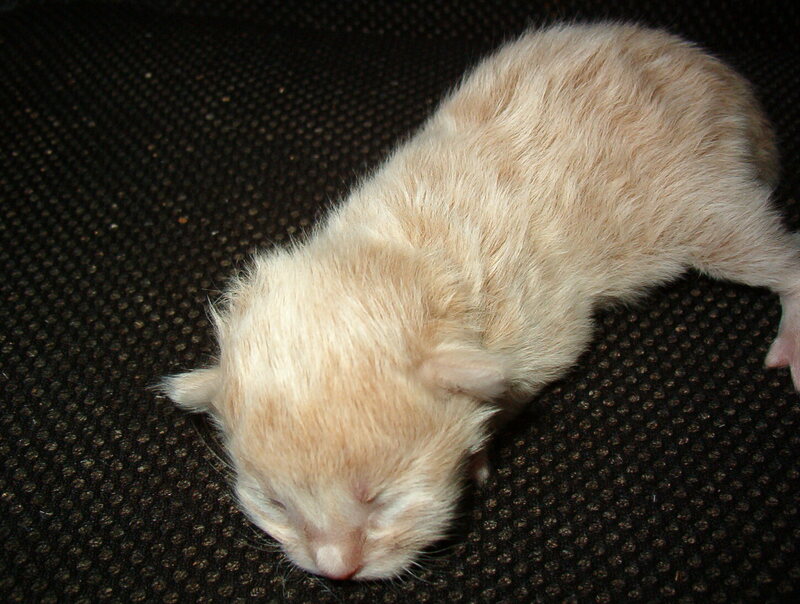 Katniss as a baby kitten. Some time ago an expert with power over my life announced to me that as a person with an autism spectrum disorder I could not possibly be creative. Since this expert ALSO seemed to conclude that I did not have Asperger Syndrome during my childhood but somehow acquired it later, making me ineligible for certain benefits, I tended not to believe him. After all, people like Vincent van Gogh, Herman Melville and Emily Dickenson are suspected of having Asperger Syndrome. They weren’t exactly uncreative, talentless hacks. But once the poisonous idea has infiltrated my mind it becomes fuel for doubt. Maybe all my writing ideas, stories, poems are all flat and lacking in creativity. Maybe no one will ever tell me because everyone somehow detects my inferior Aspie status and lies to me out of pity. Take a story idea I’ve been working on, that I call ‘Jane Eyre in Space’ because the early history of the main character, Hana Kelly, is similar to that of Jane Eyre. And the story takes place on another planet, a colony of the Terran Empire, sometime in the future. Well, using Jane Eyre as a model proves I’m not original, since if I were really creative as only neurotypical people can be I wouldn’t need to use another book as a model for part of my story. And setting stories on other planets isn’t original, it’s been done to death. And every single one of the little ideas I’ve had that make this story different— well, I had to come up with the ideas from somewhere. Something inspired them. So I just uncreatively take ideas from other places and that’s all there is to my fake claims of creativity. But no matter how much that kind of self-doubt hammers through me, I know from my reading of writing books that other writers— REAL writers, neurotypical writers— do the same thing as I do. They get their story ideas from someplace. Think of Mercedes Lackey’s Elemental Masters series, which essentially retells fairy tales as fantasy romances in Edwardian England. In fact, if the majority of our story ideas were not taken from other, familiar sources, the reader would find them too unfamiliar and bizarre to make for a comprehensible read. So: I am Aspie, I am writer. If I can do as well as those other uncreative, defective Aspies like Herman Melville, I’ll be happy with it. 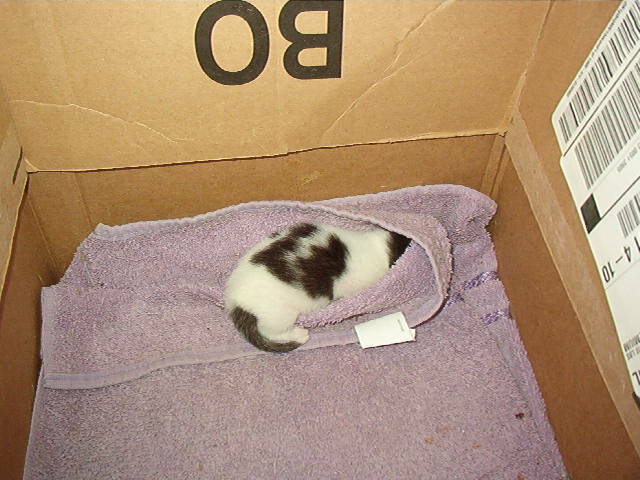 Kitten Umberto as a little baby. As an only child she cuddled in the fold of the towel when mama wasn’t in the box. So I gave her a teddy bear. It helped. Running out of good stuff to read, and since I have no money to buy books with I’m making a run to the local library in Stephenson Michigan (which is where I am posting from since my internet service is down). Finding books in a small-town library can be tough when you are as eccentric as I am. There isn’t much selection, and when the library does have a book I want to read it’s usually checked out. I was hoping to pick up Red Mars by Kim Stanley Robinson, but they didn’t have that one, just one of the later books in the series. I did find Dean R. Koontz’s Midnight, which was also on my list of books I wanted. 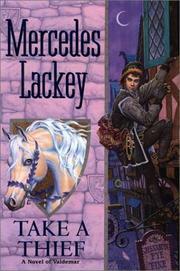 To complete my list I found a Mercedes Lackey I haven’t read (Home from the Sea, in the Elemental Masters series), which I likely will enjoy if Mrs. Lackey has managed to keep her biases in check better than she sometimes does. And I found one, Rusalka by C. J. Cherryh, that I picked just because I liked the name. So that’s my reading-material-hunt adventure for the day. How are YOU doing with the eternal search for good books? Isn’t it sad that our favorite books don’t grow and change as we do? 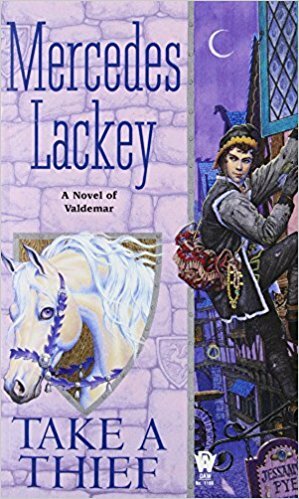 When I started reading Mercedes Lackey’s excellent Valdemar series, it was exactly what I was looking for. I was in the midst of a somewhat delayed teen rebellion and had rejected the Christian faith of my childhood and college years for Neopaganism, and I had also rejected the conservative, anti-Soviet political orientation I’d always thought was more sensible for a walk on the liberal side, more than once flirting with actual Marxism. And so the books I had once loved— the works of C. S. Lewis most particularly— were now an ideological problem, and I sought replacement. I’d heard through the Wiccan grapevine that authors Marion Zimmer Bradley and Katherine Kurtz were allegedly Wiccans and so tried both authors. Kurtz I didn’t care for, but I fell in love with Marion Zimmer Bradley and her Darkover series. And in one of MZB’s many anthologies I found a story by Mercedes Lackey and began to collect her books as well at the local used bookstores. I loved the series especially some of her heroes— Talia, the girl plagued by an upbringing among an evil sect that seemed to combine Amish traits with a dark portrait of LDS polygamy, and Vanyel, the troubled, rejected noble youth who grows up to be a happy homosexual Herald (and then died tragically to save his kingdom). But I’m all grown up now— at my age, I’d better be. My politics have slowly reverted to something more based in common sense than in the desire to rebel, and several years ago I had an experience which led to my joining the Catholic Church. And as I continued to re-read my favorite Valdemar books I began to see some cracks which made me somewhat disappointed in a once-favorite author. Rather than a pure happy-fantasy kingdom, Valdemar began to look more and more like a land plagued by a modern big-government philosophy— and one with a blatant hostility to certain religious groups as well. 1. The big-government thing shows most clearly in the high degree of centralization of political power in the Valdemaran crown. Now, in a medieval/Renaissance era kingdom a king had a lot of power— he could put his wife and his best friend to death for minor reasons as King Henry VIII did in the killings of Anne Boleyn and Thomas More. But the king’s power didn’t reach into the daily lives of his subjects except when he was willing and able to send his military forces to enforce. In Valdemar, people act more as if they were in a modern state with hordes of policemen, judges and social workers ready to jump down on both feet on anyone who disobeys the slightest directive. Valdemar clearly doesn’t have these modern accessories to state power— no medievalish state could— they could barely afford to pay their non-standing armies much of the time, which was why standing armies came along much later. 2. The Heralds of Valdemar, who live on the grounds of the Palace in Haven when they are at home, ride circuit through the kingdom, and act as judges in local cases, overriding local authority. The reason given is that only Heralds can perform Truthspell, a kind of lie-detector spell which is certainly most useful. But Heralds could be performing this spell from town to town and still allow local judges and other authorities to fulfill the role of judges. Hi! I’m a published poet, long-time blogger, & aspiring/actual writer of fiction & non-fiction. I read how-to-write books compulsively & I like to learn how stuff works. I welcome civil comments but can’t always reply as I’m over-busy & also because I have an autism spectrum disorder and social interaction’s not what I’m good at. Become an Antimatter Life Insider and sign up for my email newsletter!